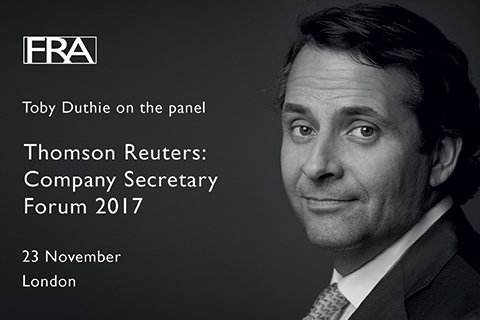 FRA Founding Partner Toby Duthie was at Thomson Reuters: Company Secretary Forum speaking on the corporate crime panel. Toby was joined by Peter Binning, Corker Binning, Roger Burlingame, Kobre & Kim and Francis Kean, Willis. The panel tackled the growing enforcement risk; corporate liability in relation to internal investigations and how to educate the Board on developing the right response to investigation risk. Perceived Corporate Criminal Liability as a big or bigger risk than Brexit. Companies should check their Directors and Officers (D&O) insurance to ensure sufficient limits and flexibility. The SFO is majorly stepping up post Rolls Royce.